North Carolina is a well-known hotbed for big money bracket racing and the talent it attracts. One specialty event designed specifically for Top ET or Super/Pro door cars competing for a lucrative $20,000 enjoyed a three-year run, but was in danger of extinction. 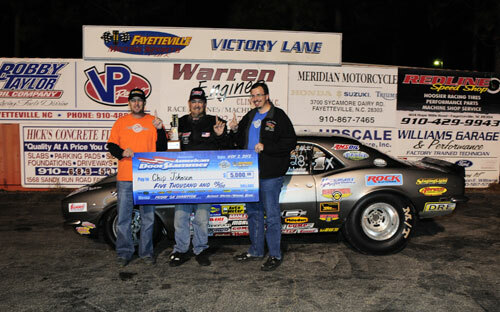 The partners in Loose Rocker Promotions, LLC, Anthony Walton and Michael Beard, recognized the value and popularity of the format, and rebranded the event as the American Doorslammer Nationals, hosted by Fayetteville Motorsports Park, in Fayetteville, N.C., November 2-4, 2012. The $20,000 main event was bookended by two $5,000 races, plus a 64-car limited field shootout. Throw in sponsor prizes, and the total weekend paid out in excess of $65,000 in cash and prizes! 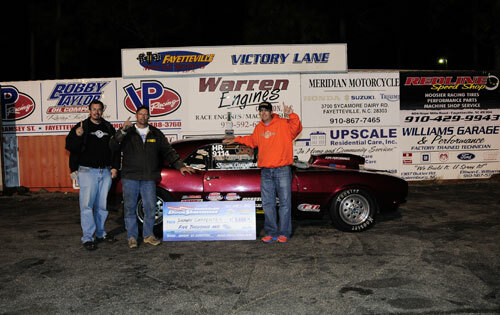 Local racers upheld the honor of their home track in the $5K Warmup on Friday, with the final round featuring 3-Time IHRA World Champion "The Legend" Chip Johnson from Fayetteville, and 2011 track champion Tim Lucas, of Clinton, N.C. Johnson repeatedly laid down solid packages without any frills, simply forcing his opponents to beat his run or go home. In the semifinals, Johnson used a significant .012 to .054 holeshot to trailer Rick Whaley's dead-on 5.007 with a 6.306 (6.27 dial-in), while Lucas earned a reprieve from his .051 light when Greg Broadway turned it red with a -.006 foul. In the finals, Johnson's .027 bulb and a dead-on 6.280 (6.28 dial-in) held off Lucas's close but later .031 light, coupled with a dead-on 6.155. "I had a couple of .02 - .03 lights, but once I figured it out, I was oh's and teen's most of the weekend. I was comfortable," offered Johnson. "I was just staging the car and letting go. It's been like that about two months. I'm comfortable, but on the bad side, I might get cocky and every now and then I turn it double-oh red, but for some reason, ever since Donnie Gibbs put that front end under my car, my lights have just been there. I'm tickled!" In addition to Gibbs Race Cars, Johnson thanked Mickey Thompson, Rock Batteries, Abruzzi Racing Transmissions & Converters, Staging Light Graphics, Hickman's Performance, DRE Engine Diapers, and his family for their support. 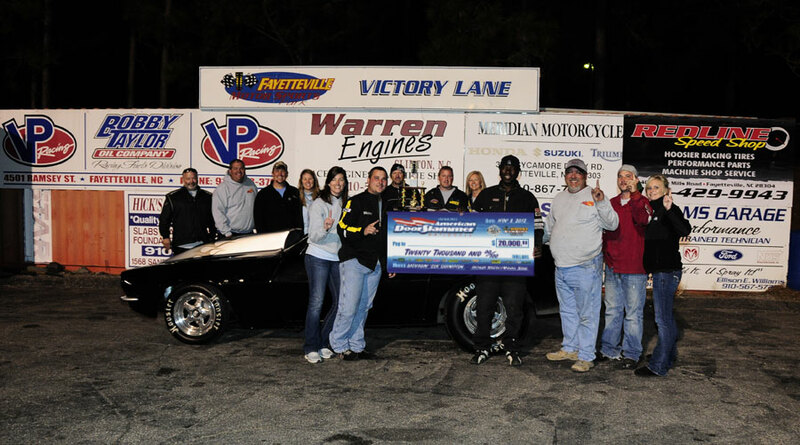 In September, Raleigh's Richard Alford, Jr. earned his second IHRA Div. 9 Modified ET title at the Bracket Finals. While primarily known for his footbrake prowess, Alford's results quickly reminded everyone that his skills are that of a pure bracket racer, not locked into any one style of racing. His list of accomplishments is long and varied, including a win and a runner-up in back-to-back $20K's in his dragster. He put an exclamation point on his resume with not only a decisive victory in the $20K Main Event, but also a semifinal appearance in the BRODIX Legendary 64 Shootout, first place in Sunday's Dash for Cash, and also a runner-up in Sunday's $5K Finale - a laundry list accomplished while driving not one, but two borrowed cars! His familiar Chevelle was down for the count, but he piloted a Camaro for Ronnie Roberts Racing, and a Mach 1 Mustang for Danny Lawson. "The way I've started coming off the button, it works the same in all three cars. They all have the same GT steering wheel, and Shawn Carpenter loaned me a button like I have in the Chevelle." 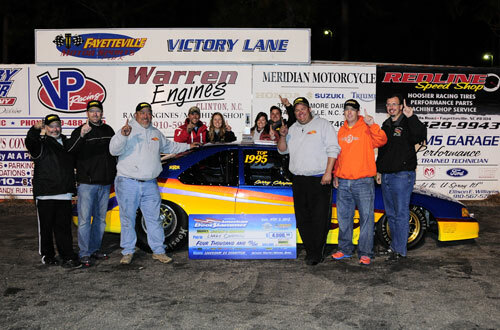 The big win came behind the wheel of Wesley Roberts' Camaro. Alford set the tone for the day with a perfect .000 reaction time in the opening frame, and only had two lights worse than an .017 in the eight round race. His miss was an .031 in the quarterfinals, in which he still had the tree, and he ran dead-on to advance. Notably, Joe Passero kept the Canadian invasion alive with two entries, until dropping both in the quarterfinals. In the semifinals, Alford carded an .017 light and a 6.000 (6.01) after Randy Sessoms hung an -.011 red light to discard a 6.820 (6.83) effort. Greensboro, N.C.'s T.G. Paschal similarly benefited from a semifinal redlight from William Roberts, whose -.009 foul negated a 5.990 (5.96). Paschal won the round with a .009-initiated 5.626 (5.61), but broke the rear end in the process. That left Alford to take a competition single for the final round victory, the Iron Tree trophy, the big check, and a custom helmet paint job from Phillips Auto Body. "I didn't know he was broke until someone told me," admitted Alford. "That's a bad way to go, when you can't get back to a final." "It was a great first race. As it goes on, I know it'll get even better. You wouldn't believe how much the sponsors mean to people," said Alford, who had his own list of people to thank. "I need to thank Ronnie and the whole crew at Ronnie Roberts Racing, Larry, Shawn, Wesley and his wife: they all worked hard. I give Michael and Anthony props for putting on a great race, and the Fayetteville staff for working their tails off!" Another Ronnie Roberts Racing entry, the Thunderbird driven by Larry Chapman, of Willow Springs, N.C., graced the winner's circle Saturday night. With no buybacks, a limited field of 64 cars vied for the $4,000 top prize, plus a $1,000 gift certificate from Brodix. Chapman earned his way into the finals with an .014 to .035 starting line advantage over West Virginia's Mike Daymude, using a 5.389 (5.36) to slip inside of a 5.424 (5.40). Roseboro, N.C.'s Arnold Smith likewise treed Eric Thomas, .022 to .044. He denied Thomas's dead-on 5.536 with a perfectly dead-on 6.760 of his own. "If not for Ronnie, I couldn't be doing this. He's a big help to racing around here," said Chapman. "I've been in twelve finals this year, but this was only the second win. I was hoping to do it, and set my mind to it. It felt good! The car stuck all day. It could have run dead-on at any time. I like the shootout. It was tough! Your adrenaline pumps more, with no buybacks. Thanks to Anthony and Michael for a real good race. We enjoyed it, and we'll be back. Thanks to the whole Roberts family, Danny Moon, Performance Specialties, and my wife for putting up with me!" As a side note, Arnold Smith was also the recipient of the Phillips Auto Body Best Appearing award for his "Natural High" Nova, famously once owned by N.C. Drag Racing Hall of Famer Steve Taylor. The Nova sustained severe tornado damage in 2011, turned over on its roof. The reconstruction had been completed just three weeks prior to the event, and painted by Ronnie Crews. The Redline Speed Shop Best Engineered award along with a $100 Gift Certificate was presented to Michigan's Steve Higel for his impressive '65 Mustang. Elm City, N.C.'s Shawn Carpenter is a rising star that could attest to the level of competition at the American Doorslammer Nationals. Although Carpenter has found the winner's circle at Fayetteville before, capturing a $3,000 Carolina Bracket Series victory in February, that never makes it easy. He might not have even been racing on Sunday, if not for Robbie Draughon of Redline Speed Shop for welding up a broken rack on his Camaro. Welding rod is hot, but the competition on the track was even hotter. "I was perfect second round," recalled Carpenter, but going down to the fourth digit put his and Arnold Smith's identical .0005 reaction times behind Daniel Woodruff's .0004. "Then I had to run Derrick Willard third round on my one entry, and he was perfect on me. I ain't never seen so many double-oh's. In 32 passes over the weekend, I had 21 double-oh's. I couldn't believe it. Everybody was killing the tree!" Down to six cars, each winner was double-oh on the tree, including Carpenter, Woodruff, and Alford. Carpenter's .004 was the best of the bunch, giving him the bye to the finals. Alford, this time driving Danny Lawson's Mach 1, made his second final of the weekend after Woodruff bulbed it away with a -.003 foul. Alford tagged a .007 light, and with the win light already in hand, shut it off early. Even with all of the runs he recorded on Sunday, Carpenter's .021 in the final was only his second .02 bulb of the day. Alford trumped it with a .005 start, but took just .001 too much stripe. Carpenter ran a closer 5.996 (6.00) for the double-breakout win over Alford's 5.405 (5.41). "We've run before, but this was the first time in the finals. He's a good guy. Richard's taught me a lot over the years," said Carpenter. "I live it, breathe it, love it. I still get giddy when the win light comes on." After the win, Carpenter drove back up the track. "Larry Chapman does it when he wins. I knew he was down there on the line. When the win light came on, that's the first thing I thought of!" Carpenter thanked his wife and kids, Junior at Bissette Performance, and Ron's Flying Toilet. Loose Rocker Promotions has announced that the American Doorslammer Nationals is slated to return to Fayetteville Motorsports Park for its 2nd Annual edition, November 1-3, 2013. "You could tell that Alfonso Currie and the Fayetteville staff all took great pride in hosting a big event, and it showed" said Michael Beard. "I heard great compliments from our customers. Everyone worked together to make it a great event for our racers. It was a good start, and with a few tweaks, I think next year can be even better!"